Director Danae Elon is all about making the personal political, like filming her 2009 documentary Partly Private examining circumcision while she was pregnant with a son. At the start of this documentary (which had its New York premiere at last year’s DocNYC Festival), she’s pregnant again and leaving hipster Brooklyn with her two young sons and her photographer partner, French-Algerian Philip Touitou, to return to her home town of Jerusalem. She’s not just a sabra, a native born Israeli, but the daughter of a prominent leftist Israeli writer, the late Amos Elon (seen in photographs, archival clips, and tapes of their conversations). “Heartbroken”, her father very publicly left the country, where his parents had fled from Austria, in despair over the failure of the two-state solution to provide a Palestinian state. Despite her beloved father’s admonition not to return, Danae is homesick and eager to walk her children through her favorite memories (as seen in photos). Ironies abound. She missed the desert – but they are greeted by a rare snowfall. Three months after the move, she gives birth to another son, Amos, and the primary time marker on screen over three years is his growth. She’s sure they can cross any barriers by living through personal example and enrolls her kids in the only integrated Jewish/Arab school in the city. At the beginning, her smug, liberal do-good-ness is almost insufferable, triumphant that she and the kids do make friends with one intellectual Arab family. Until the reality of life in contemporary Israel begins to smack them in the face and finally makes them seem more normal. The expansion of the conservative, ultra-Orthodox population around her old neighborhood makes her uncomfortable even as public celebration of Purim with costumes in the streets is more fun than she remembered. Her husband is quick with his reaction: “I don’t like this place.” While she attributes “his sense of belonging was off” to his lack of Hebrew fluency, it’s not clear what’s happening with his career, though the final scroll tells of his exhibits that resulted. He only looks happy when they’re off hiking through her favorite nature reserves. But they’re never far from the strained politics; on one trek, she has to answer her son that the smoke in the distance is settlers burning Palestinian olive trees. Her sons can see for themselves that the Jewish and Arab kids at school mostly don’t play together. By the time of the Gaza war in 2014, the external tensions aggravate their internal ones, and she gives up on her personal experiment. Jerusalem-based Arab-Israeli writer Sayed Kashua made the same wrenching decision about the same time for his family. Ironically, where Danae settled on Montreal for her husband’s bi-lingual comfort (where her kids report on tensions between the English and French-speaking students), Kashua landed in the U.S. heartland of Champaign, Illinois where he regularly reports how his kids are turning into All-Americans. For all her politically correct talk about the occupation, apartheid, and Palestinian rights, Danae Elon humanistically shows that a woman’s separate peace can only go so far. 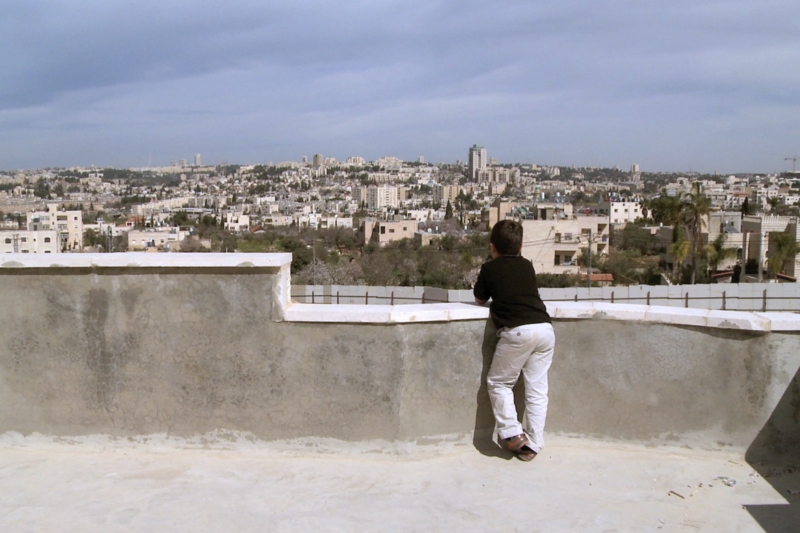 Top Photo: One of the Touitou Elon boys looks over Jerusalem.